Selecting the right person or business to collaborate on your video content can be hard if you have no experience in the field and how can you really tell the difference on price? They all tell you they are selling apples when in fact some are selling oranges and though you tell yourself that apples and oranges are both delicious it is clearly obvious to you that they are not the same fruit. 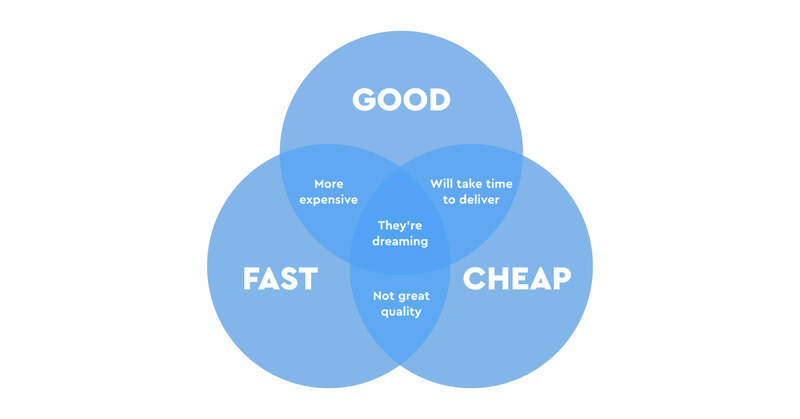 If you’ve ever worked in design (or worked closely with a designer who has tried to school you on how the process of design works and how to get the best outcomes from the design process) you are probably somewhat aware of what is affectionately known in the design business as the designer’s holy triangle. It’s an image like the one above which proposes three essential options a client can consider when briefing in a new job… The catch is you can only pick two of them. While this theory that a client can never really have it all has often been applied and associated to the design process it is also relevant to and at the very least something you should consider when budgeting for a piece of visual content (video + animation). Because good and fast means the maker of your video will do whatever has to be done to get the job done on time. This often means spending more in resources, overtime and general costs just to achieve this (even things like location fees and permits can cost more if they have to be rushed through). The maker of your video also may have to exclusively dedicate resources to your project and this takes them away from other projects and as such has a cost associated with it. Good and cheap isn’t an impossible dream it often means that the maker of your video really wants to make your content and to do so has offered you a discounted price and as such will more than likely use more internal resources to keep their costs down… They may also need to prioritise other jobs ahead of yours so that doing this doesn’t adversely affect their business or their other clients. In Visual Content this is often true and I’m not just talking about production value I am talking about the overall quality of the content and its ability to reach and connect with your audience. There is no value in a piece of content that fails to connect with your audience and what’s even worse is a piece of content so poorly produced that it actually alienates your audience (video and animation is a reciprocal medium that relies on an audience connecting with the content). 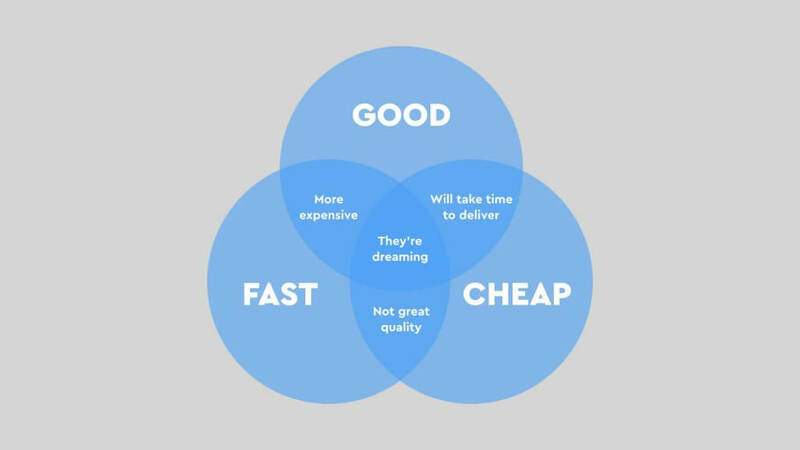 Why not try keeping the designer’s holy triangle in the back of your mind… It helps provide some perspective on costs and what the quote that’s lowest on paper might really cost you in the end.